Mardi Gras 2017 in New Orleans shifts into high gear on Feb. 11 this year with a parade known for its decidedly adult themes – Krewe Du Vieux. Here is their new route. No biggie. Just a wish for another happy day to you and yours. Writer Rebecca Solnit calls Christmas Day one of the 3 Punitive Holidays, the other being Thanksgiving and Valentine’s Day. Certainly seems like the Western world overdoes these with the result that those without formal traditions feel punished. I am one of those without traditions by choice, even though I have access if I so desired. I could show up for gift-giving or a special meal at my non-traditional mother’s place but like many of us in the FQ, her home is for quiet time and so her holidays are calm and simple. My sister’s life is firmly in the Midwest where she has a fluid set of her own traditions with her friends and her son. And even though many wonderful friends invite me over to their own ramped-up holiday activities, for the most part I decline. It’s not that I don’t like to eat great food or to see people in a celebratory mood; it’s just that I like those made into everyday, informal activities. I like regular days and organizing my days around drama-free activities and tasks, keeping my day open for impromptu meet ups with friends and acquaintances. Having coffee with pals in late morning or a cocktail and appetizers at the bar of a nearby restaurant or hotel in midweek is what I think is special. It’s why I like markets and not festivals: markets are a public and regular part of a week’s activities while most festivals are outsized events celebrating some cultural touchpoint that often requires hours away from home which often has a negative impact on regular commerce and far too often an extra fee for participation. The only holiday I really celebrate is Carnival because the main activity (for locals) is to meet up and hang out with your friends and neighbors. In fact, the entire Carnival season, through customs built by families and neighborhoods, allows you to join in when and how it is convenient to your routine. Even the actual holiday of Fat Tuesday is mostly about roving, casual conviviality although, as befits the last day of a long season, it does have added costumes and a large amount of mood accelerants thrown in to pump it up a bit. Most importantly, Mardi Gras has not (yet) been entirely taken over by the retail sector even though many attempts to scale that wall have been made. It is true that New Orleans’ Carnival has some deep, oligarchic tendencies – some of those hidden from view while others on full display without any irony or shame – but at its heart, Carnival is about regular people in public spaces employing satire and performance to comment and view others’ feelings on political power, class divides and cultural ties. That’s my kind of special time. I think it’s high time we reduced the emphasis on Hallmark Holidays and use our creativity to instead create more everyday get-togethers. If people resisted the pull of these formal set-asides, more people would then start their day with anticipation upon remembering that it’s Saturday morning again. Or would take a long weekend off as a family to sit around and make a special meal together. Or send cards randomly to exclaim Happy Winter Day or to share your best hopes for a Bright Autumn. The third Tuesday of the month could become a simple gift exchange for your crowd or extended family. Use one’s gift-buying impulse to get some gloves or socks and share with those who are outside regularly. Use the kitchen time to prepare some treats or plates of food and share with those without. Marathon showings of movies on the shortest day of the year could still happen on those channels that seem to specialize in those. Close the stores early every 21st day. Wrap your homes in lights to celebrate the nearby high-school spirit. Have a block party on election day. Or just be in silence and quiet reflecting on the specialness of the world around us. In these ways. we can use those warm feelings that we seem to only reserve for our fellow man on certain holidays, year round instead. One of the best parades and since it’s a walking parade through the Quarter, it is doubly special. January 6th is the Feast of the Epiphany and the kickoff day for Carnival each year. It is also Joan’s birthday, so the parade is one of two that revelers can enjoy, along with the Phunny Phorty Phellows’ streetcar parade. 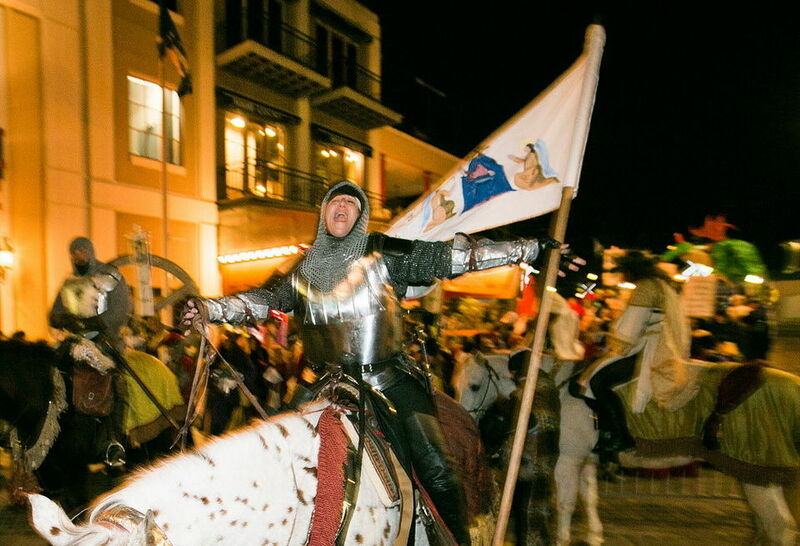 This krewe has open membership and has slots open now for the 8th annual Joan of Arc Parade January 6, 2016. 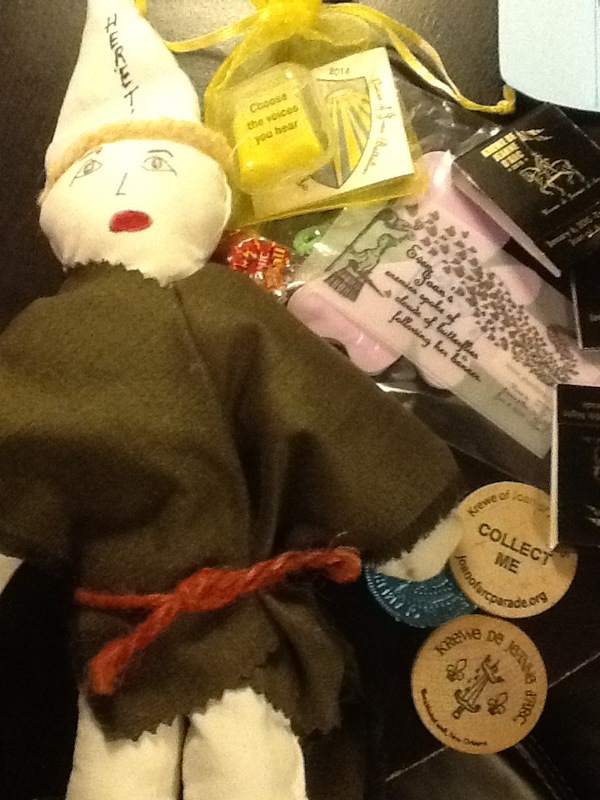 Two types of membership: Full Members: Full members “Officers” walk in the parade portraying medieval French townspeople and characters associated with Joan’s story. You would probably think that it is better to have a balcony than a courtyard, but for the most part, its the other way around. Balconies mean noise travels to your rooms constantly and although it is fun to be viewed when you want to be viewed, it is not fun to be viewed when you just woke up and are just trying to have your coffee in the sunlight. Also, it is likely that you’ll have short-term neighbors on a balcony next to or across from you who believe that it is necessary to WHOO-HOO throughout the night or to buy cases of beads to throw down at people. Between my mother and I, we have lived in slightly less than a score of places in the last 35 years in the Quarter, and only two or three times have either of us had a balcony apartment. Balcony apartments are also more expensive and mean stairs to climb, often rickety stairs! However, the best of both worlds is a balcony overlooking a courtyard, as long as the neighbors don’t congregate below late at night. That way, you get air flow and no one above you keeping time to music at 3 a.m. This leads to a strange irony in the Quarter; most of your regular neighbors are super quiet and you never see them. If you drink to excess, you have a bar to do that near you. If you like to dance or sing, again places near have that. Most of us live in tiny spaces (a result of 18th century buildings cut up in the 19th century into tiny places for immigrants and po folk) and are fine with it, but it does cut back on home visiting. And after all, “let’s just meet at (enter name of new or fun place to eat or drink)” is appealing to just about everyone who visits you. 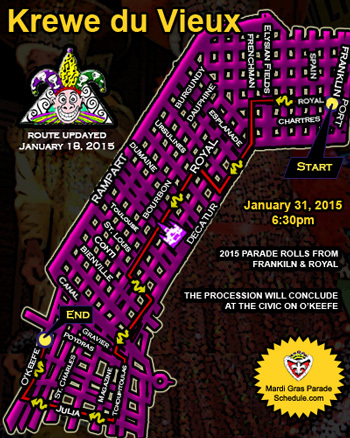 Traveling in or out of the Quarter during Mardi Gras is tricky and needs some planning. Well, it’s simple really: you need to get rid of your motor vehicle or pay a princely sum to put it in a garage. That’s right, no parking in 2/3 of the Quarter on the last weekend (and parade days before that) and restricted driving. I use a scooter and have it parked against the building (as required, leaving a 3 ft walkway) at the side of the public building next to mine. The workers know me and can alert me if anything happens to it. During Carnival though, it’s best to move it, as I live on one of the well-traveled spots whoo-hooing spots. So, I park it next to the little Red Schoolhouse (a elementary-level school, our last school in the Quarter, where Elvis’ movie King Creole filmed their high school scenes) and hope that no one messes with it. Don’t mess with it. There are really 2 ways to go here at all times, but especially during Carnival: either plan ahead and stock up on food or have the delivery menus ready; restaurants are mostly no-go as the lines pile up for hours before and after parades. Dozens of places offer take out and almost all of them can deliver too. Most of us are partial to the Nelly Deli (Bourbon), Verti Marte (Royal), Deja Vu (Dauphine), Mona Lisa (Royal), Matassa’s (Dauphine), Chinese food (two on Canal) or pick up at Wink’s (Decatur), Fiorella’s (Decatur), Petit Amelie (Royal), Bennachin (Royal) are some of the usual places we hit. 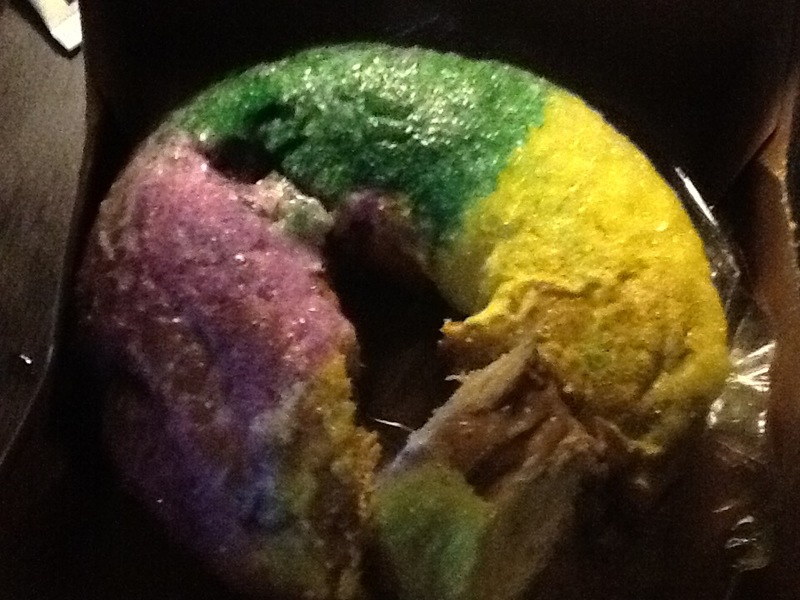 This year, I am also adding a new tradition of Lundi Gras brunch at Meauxbar. My pal Kristen Essig is their brilliant and capable chef and has put together a fantastic menu. Let’s hope it’s not a zoo. 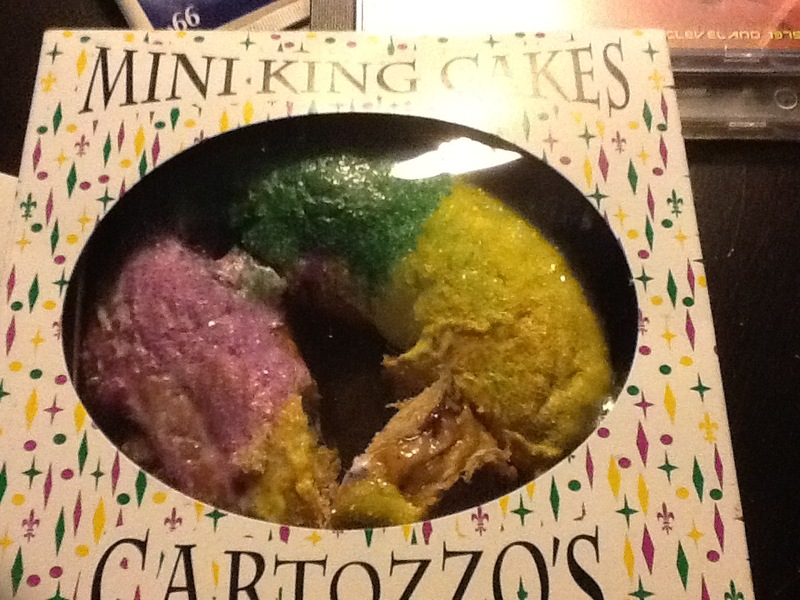 Only one way to go during Mardi Gras: have your house stocked beforehand. I use my favorite liquor store in the Quarter at Vieux Carre Wine and Spirits; fantastic place with an amazing selection and. they. deliver. I feel lucky that I get to live in a place where New Orleanians of every talent (legal and illegal) can try to make a living. Chief among those legal talents are the musicians who populate every block during Carnival. I do find it deflating to see how many young transient white kids with barely the ability to pick a banjo have taken up so many spots. Still, some are these are good and good local musicians can be found on certain corners. The stories about our street musicians would astound most people, from those who lived in a van parked on the street and raised kids in that van for years and years, making a living and sending those kids onward to good lives from it, or others that have been out there daily for years, rain or shine, heat or cold and now have become the gentry (“eyes on the street”) of that block. However, when a man who thinks he has the ability to sing “doo-wop” (but does not) sets up across from your doorway regularly or someone who only knows 2 or 3 songs and sings them again and again next to your door, you can grow cynical and be seen in your pjs at midnight shouting at those poor misguided souls. For me, it takes going out in the evening with a cocktail in hand and finding one of the good ones and listening and watching the crowd take extreme pleasure in coming across this or these musicians to renew my love of live street music. I am working on a new project that will detail how we get by here with “a job, a gig and a hustle.” People are sharing their stories with me and I am working on adding essays about the sharing economy and illegal economies to it as well. Stay tuned for news on that…So when I say hustle, I mean that thing some of us have to do to make the ends try to meet; it may be an illegal hustle or an informal hustle, but it is visible across the Quarter most days and certainly during MG. It includes someone standing in line on behalf of the Uptown dining crowd at Galatoires, or selling second line parasols right off Bourbon on the hood of a truck (you know its a hustle when no signs announce things are for sale; you need to ask so that the vendor can be sure you are not trying to bust her), or even driving a pedi-cab, which, by the way, is a good idea to take for those of you out way late and trying to cross the Quarter. It’s amazing to me how many hustles I see in a block or two, and how much I admire the willingness of people here to try it and for all of us to support it. Still, some of the hustles are dangerous, and so be alert and know that if locals see something bad about to go down, we’ll help if we can and alert law enforcement too (found this weekend every 3-4 blocks of the main drags). Be extra careful and don’t be stupid is the best advice I can give you. Walk into a hotel lobby or into a bar to look at your smart phone and leave the purses and wallets tucked away in your room or in the safe. Stay with crowds and expect that villains are afoot. And don’t throw trash or pee or puke on our steps or doorways please. All in all, I am glad to be here even at the foulest and loudest time of year. I appreciate the joy and wonder I see as our visitors can’t believe their luck to be here on a sunny and warm February acting out their inner child as part of our public spectacle. Welcome. Now get out of my way. 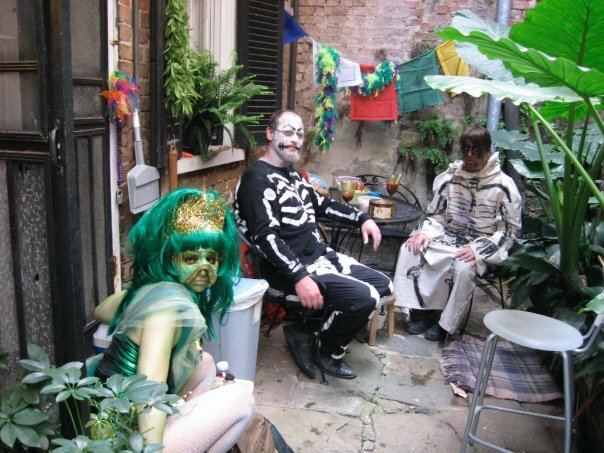 Some of my pals visiting me on Fat Tuesday during an earlier French Quarter life of mine..